or an appeal of a City Arborist’s decision (white sign) to permit the removal, destruction or injury of trees on the property has been filed. No posting is required to remove a dead, dying diseased or hazardous (DDDH) tree; however, a permit must still be obtained from the Arborist Division prior to cutting the tree. An orange sign on the property announces the potential for tree removal or tree damage on that site. 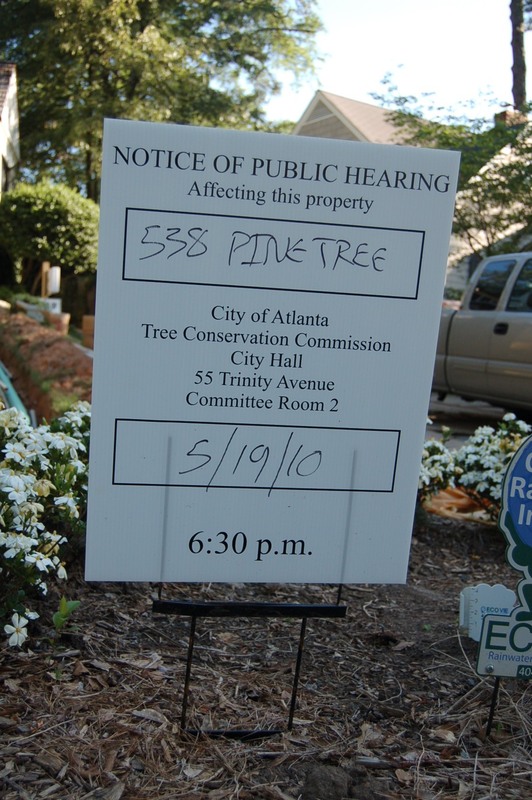 If the initial evaluation of a building site plan indicates the intent to remove, destroy or injure trees on the subject or adjacent properties a “Notice of Plan Submittal” posting is made by placing an orange sign on the property announcing the potential for tree removal. This sign must remain in place for a minimum of 10 calendar days. The affected trees do not need to be marked at this stage. 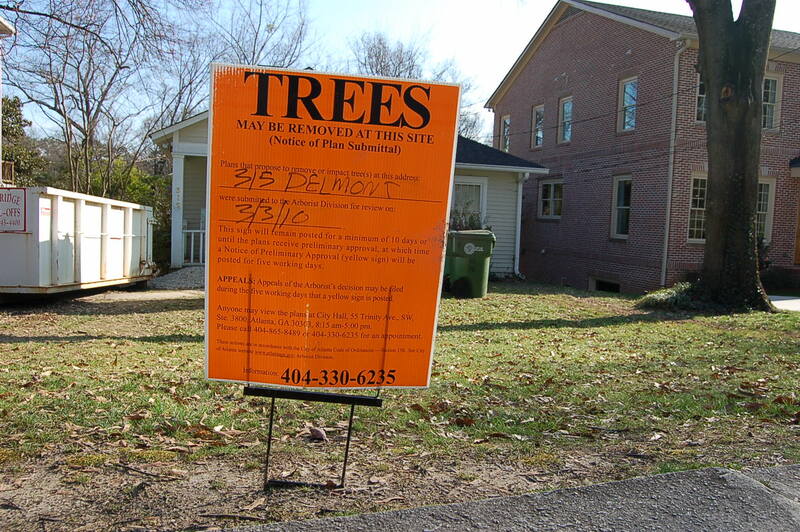 When you see an orange sign, you should contact the City Arborist Office at 404-330-6235 and request to see the building site plan for the property. The site plan should include information about which trees will be impacted. 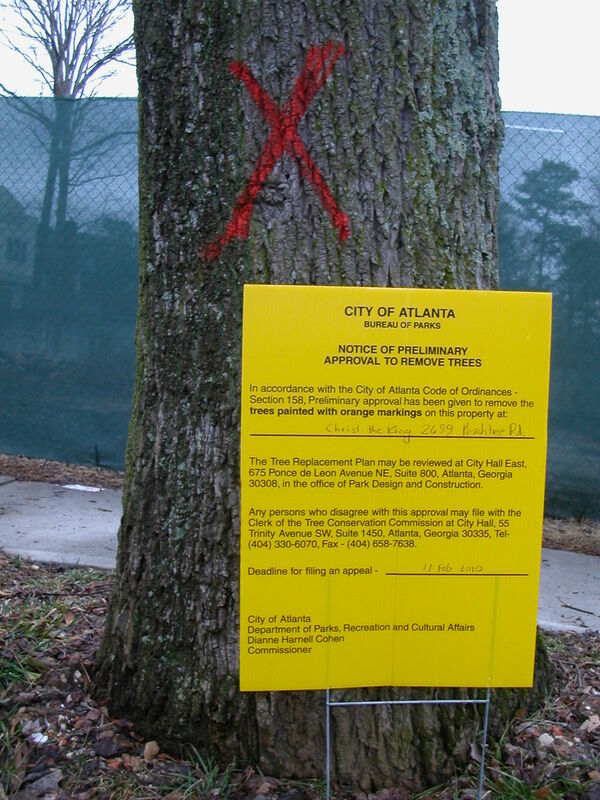 You will have to go downtown to the City Arborist Office (at 55 Trinity Avenue, Atlanta, GA, 30303) to see the plan; at this time site plans are not provided online or by fax or mail. However, you can request that the City Arborist make a copy of the plan at your expense. You may also choose to contact the owner of the property directly to discuss your concerns. Some owners will be open to discussing alternatives to help protect the trees on the property, but some will not. The owner is under no obligation to protect the trees beyond what is required by the Tree Protection Ordinance, so you should realize that your requests that go above and beyond the requirements of the ordinance may not be met. Anyone is welcome to attend the hearing and request to speak in favor or against the appeal. If you wish to speak at a hearing, make sure to fill out a green card which is available at the front of the hearing room declaring your intention to speak. You will not be called on directly to speak (which means you can change your mind about speaking at any time), but you can stand up and say that you want to speak when the Tree Commission asks if there are any comments or rebuttals after the appellant has presented his or her case. You will have up to five minutes to speak in the rebuttal period, but you should think about keeping your comments as brief and succinct as possible for maximum impact. Once testimony is over and the Tree Commission has gone into their discussion period, no more questions or testimony can be given, so make sure to get your comments in before they begin their discussion of the case.